Greg Frazier knows a thing or two about riding around the world. Afterall - he's done it five times himself. Frazier's latest book is the result of 16 years of research. 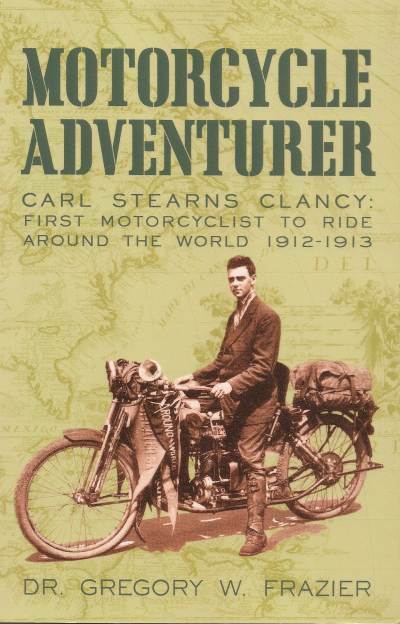 Over the years he's re-traced much of the Carl Stearns Clany's original route and verified the original travelogue, researching the amazing adventure of Clancy, who, at the age of 22, started out on the first around-the-globe ride. Clancy completed an incredible 18,000 mile ride around the globe long before there were gas stations, motorcycle repair shops, roads, ATM’s, GPS’s, or the Internet. His 10 month journey took him from west to east across Europe, Africa, Asia and the United States of America. Clancy faced wild animals, bandits, unfriendly border officials, lack of gas and spare parts plus the unknown of travel by motorcycle where no motorcyclist had ventured. The roads and tracks had considerably improved from 100 years earlier, but political situations and country entry requirements had worsened for Frazier. In doing his research, Frazier found himself in the jungles of Malaysia, sands of Africa, and rugged Rocky Mountains of the USA as he trailed Clancy. Up until know no one was certain if Clancy, riding a 1912 Henderson motorcycle, was, in 1913, the first person to “girdle the globe.” With the help of numerous researchers and global motorcycle experts the mystery of who was “the first” to circumnavigate the globe by motorcycle has been conclusively solved. Clancy crossed Algeria - not so for Frazier, who could not secure a visitor or transit visa when attempting the same route. Seemingly easy entry for Clancy to China had twisted to a prohibitive expensive proposition for Frazier. However, Clancy found when attempting to enter China there were no roads, so both were faced with barriers, only different in nature. Throughout the book more challenges for each rider are chronicled. The book, has 120 original graphics and images of places Clancy passed through as he “girdled the globe.” His adventure has been described as “The longest, most difficult, and most perilous motorcycle journey ever attempted,” the first global adventure ride by one of the first adventure riders. MOTORCYCLE ADVENTURER – CARL STEARNS CLANCY: FIRST MOTORCYCLIST TO RIDE AROUND THE WORLD 1912-1913 (ISBN: 978-1-4502-2141-2) Click here to order your copy now.